Kerala’s most visited city has plenty of history, culture and architecture to keep anyone occupied for a good few days. 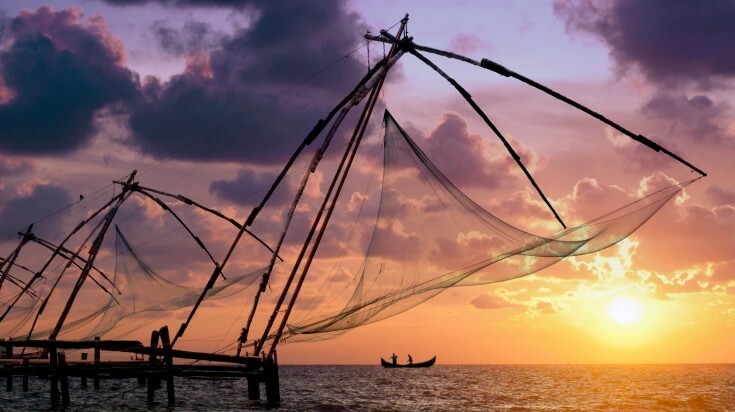 Explore Fort Cochin and the streets of Mattancherry for a glimpse of the city as it once was before taking the obligatory photo of the iconic Chinese fishing nets as dusk falls in the evening. Best time to visit: The best time to visit is during winter (October – February) since this is when temperatures are at their most comfortable. However, if you can put up with the heat, summer (March – June) is far less busy. The monsoon season (July – September) is best avoided. Good to know: If you don’t have time to explore the remoter parts of the state, Cochin is the best place to experience Kathakali, Keralan ritualised theatre. What you will see is a version specially adapted for tourists, but at least it will allow you to imagine what a real performance must be like. 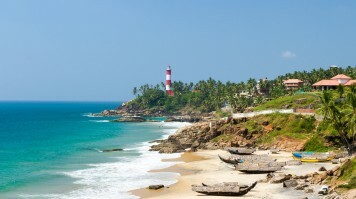 Back in the 60s, Kovalam was the preserve of intrepid hippies making their way down India’s southern coast. However, in more recent decades, it has transformed itself into Kerala’s premier beach resort. Expect idyllic palm-fringed sandy beaches — along with plenty of other tourists during the busiest periods. Best time to visit: December to mid-January is peak season — Kovalam becomes overcrowded, and accommodation is at its most expensive. The months either side of this, from September to November and then January to the end of February, are the best times to visit. The monsoon is usually from July to September — this is not the best time to go. Good to know: Swimming conditions in the sea at Kovalam can be unsafe due to strong undertows, especially during the monsoon. Pay attention to the warning flags and be vigilant if you are travelling with children. The former capital of Cochin state now styles itself as the capital of Keralan culture. The town is a pleasant place to pass a few days, but the real appeal lies in the surrounding area, and Thrissur makes the perfect base from which to explore. This is the place to come if you want to experience the state’s culture at its most authentic. Best time to visit: The best time to visit is winter (December – February) when temperatures are cool, and the weather is relatively dry. Summer (March – May) can be oppressively hot, while the monsoon season (June – September) sees heavy rainfall. Good to know: Thrissur’s renowned annual event is the vibrant, boisterous festival of Puram. It takes place on a single day in April or May, and if you can time your visit to coincide with this date, you will be treated to an exuberant display of traditional processions, music and celebration. Expect it to be loud. 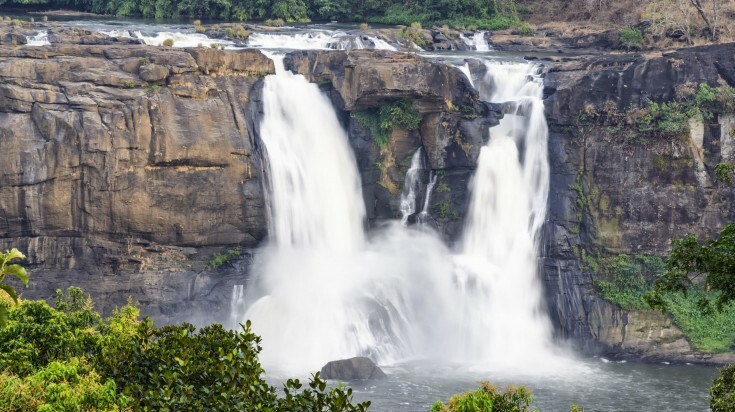 Less than 60k from Thrissur can be found the largest and most spectacular of Kerala’s numerous waterfalls, often referred to as ‘the Niagara Falls of India’. The crashing waters have become the backdrop to a popular picnic spot, and the area is surrounded by evocative jungles that teem with animal life and an abundance of birds, including four species of hornbill. Best time to go: To see the falls at their most spectacular, the best time to go is during the monsoon (June – September) when the rivers are at their fullest. However, this is also the most hazardous time to visit due to high rainfall and slippery paths. A safer alternative is during winter (November – February) when the weather is cool and dry. Summer (March – May) can be overbearingly hot and is best avoided. Good to know: The nearest train station is at Chalakudy, and the falls can easily be visited from there by bus or taxi. Another option is to visit from the town of Angamaly where buses or taxis are also available. 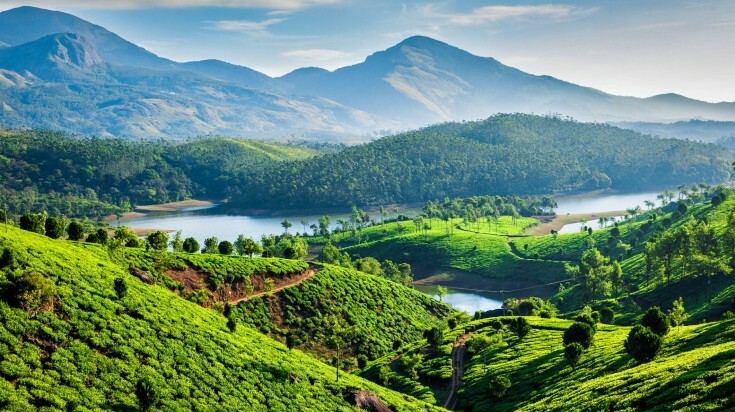 A former colonial-era hill station, Munnar is now best known for its vast, picturesque tea plantations that stretch out in all directions, making it a popular destination with local honeymooners. The town is home to a tea museum, and the surrounding area offers good hiking, interesting villages and abundant wildlife, most notably in the nearby Eravikulam National Park. Best time to visit: The best time to visit is from October to March. This is the period after the monsoon when the area is at its lushest. Take waterproofs and warm clothes because rain is still possible and temperatures can be cool, especially at night. Good to know: Munnar is also famous for a type of flower that blooms only once every 12 years, covering the hills in a carpet of blue. Unfortunately, the last flowering event occurred in 2018 and the next is not due until 2030. 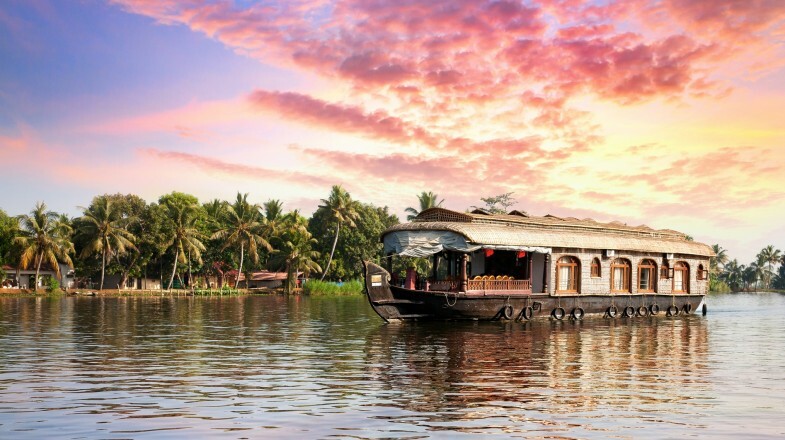 If there is one activity no visitor to the state should miss, it is taking a boat out onto the languid network of rivers, lakes and canals that make up Kerala’s backwaters. Here you will be given a glimpse of a timeless way of life along the labyrinthine waterways that criss-cross the jungle. Alappuzha is one of the most popular and convenient places from which to organise a trip. Best time to visit: The best time to visit is during the cooler winter months from November to February. March to May can see temperatures and humidity reach uncomfortable levels, while during monsoon season (June – October), you might not even be able to go out on the water at all. 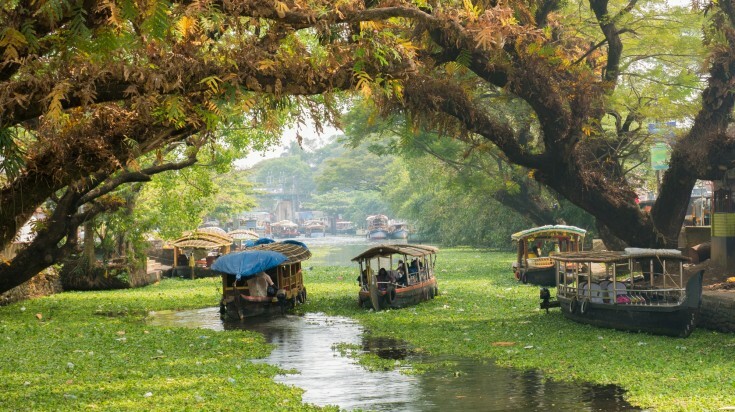 Good to know: If you want to do a backwaters trip, you have two options. For the most authentic experience, you can simply take a local ferry; these are not aimed at tourists – this is merely the way the locals travel. A recommended route is the full-day service from Alappuzha to Kollam, although there are many possibilities. The other option is to book a tour. You will be taken to various places of interest in the backwaters and can spend the night on the boat. This national park, straddling the Kerala-Tamil Nadu border and home to an array of different species, is one of India’s largest and most popular. You have a good chance of spotting wild elephants, sambar, gaur and others — and if you are very lucky, you might see leopards and tigers too. 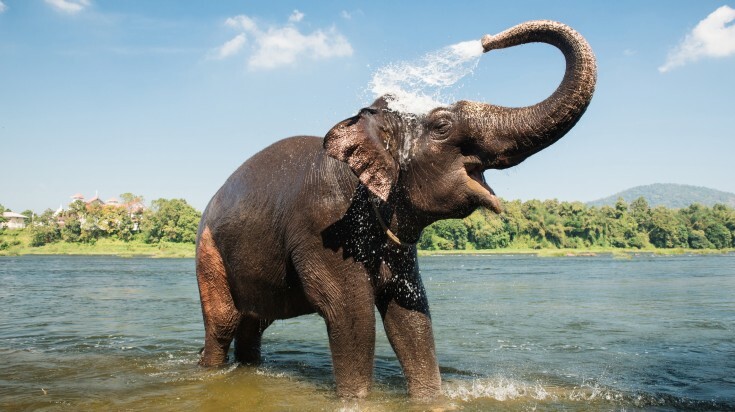 Best time to visit: Time your visit for the period after the monsoon (October – April) when drinking water becomes scarcer and the animals are drawn out of the forest to drink. The monsoon (June –September) is the worst time to visit since the rains make walking difficult and also bring out multitudes of leeches. Good to know: To visit the park you need to make your way to the town of Thekkady. From there, continue to Kumily, a small village just outside the park gates that makes a convenient base from which to organise trips into the park. The island village of Kumarakom is a renowned destination for birdwatchers due to the large number of migratory birds that are attracted to the area. Even if you aren’t interested in spotting birds, you will still be captivated by the lazy, almost somnolent charm of the tranquil rural location hidden in the lush backwater jungles. Best time to visit: The best time to visit is during the cooler months from November to February —this is also when the area plays host to migratory birds that arrive to escape the cold of winter. As elsewhere in the state, March sees the temperatures begin to rise, although the heat doesn’t reach the extremes of some places. The monsoon season is from June to September and is not recommended. Good to know: The Booker Prize-winning novel The God of Small Things by Arundhati Roy was set in a village very close to Kumarakom. For those wanting to learn more about life in the area before a visit to Kerala or anyone looking for a suitable novel to read during their trip, this book is highly recommended. One of Kerala’s more remote and less frequently visited destinations, Wayanad district, in the north of the state, is a wonderland of hiking trails, waterfalls, tea plantations and sleepy villages. For those looking for more of a challenge, a hike to the top of the 2,100m Chembra Peak will be rewarded with some of the most breathtaking views in this part of the country. Best time to go: Due to its higher elevation, Wayanad can be visited for much of the year. Possibly the best time is the period after the monsoon has passed but before the very hottest months, but you can visit any time from October right up until May. The only time to avoid is from June to September when the monsoon brings heavy rain. Good to know: Although Wayanad is a remote destination — something responsible for much of its appeal — it is well connected and easy to reach by road from the coastal town of Kozhikode, where there is an airport and a railway station. For those looking for a Keralan beach destination without the crowds and commercialism of Kovalam, just to the south of state capital Thiruvananthapuram lies the island of Poovar, a true hidden gem. Located where the Neyyar River empties into the Arabian Sea and accessible only by taxi boat, the peaceful village atmosphere of Poovar is the antithesis of the rowdy resorts of Kovalam only a little further south. Best time to visit: Poovar is the perfect winter destination from November right through to February. Since it doesn’t become overcrowded like Kovalam, there’s also no need to avoid December and January. Monsoon season (July – September), on the other hand, is not the best time for a visit. 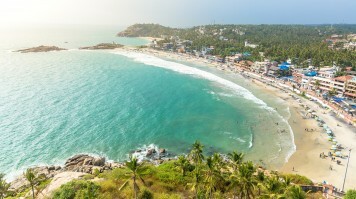 Good to know: As at the beaches of Kovalam, the sea at Poovar can be unsafe for swimming. This is especially true from June to August when undercurrents make venturing into the water particularly hazardous. Kasaragod district in the far north of Kerala, centred around the town of the same name, is primarily known for Bekal Fort, one of the largest and most imposing in the state. The district also boasts several undeveloped beaches, temples, mosques and little-visited stretches of backwater as well as good trekking possibilities for more active travellers. Best time to visit: The coolest months of January and February represent the best time to visit Kasaragod. Summer is from March to May when the climate is hot and humid. The monsoon can start as early as May and can continue until October or even November; the monsoon in Kasaragod is the heaviest in Kerala and should be avoided. Good to know: Lying as it does close to the border with Karnataka, Kasaragod is known as a melting pot where several different languages can be heard. However, like many border regions, it also has something of a typical frontier reputation, and visitors need to be a little more careful with their belongings and personal safety than elsewhere in Kerala. If your idea of a beach holiday doesn’t involve large-scale tourist development and packed-out resorts, the charms of Varkala to the north of Thiruvananthapuram might be more to your taste. While the first luxury hotels are beginning to appear, this enchanting hilltop village still retains a laidback vibe, making it the ideal spot to come and recharge the batteries. 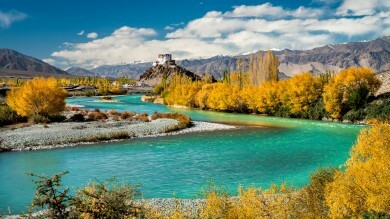 Best time to visit: The best time to visit is from December to February when the weather is comfortably warm. From March, temperatures begin to rise, and the weather is hot and humid. The monsoon arrives in June and lasts until September, making this the worst period to visit. 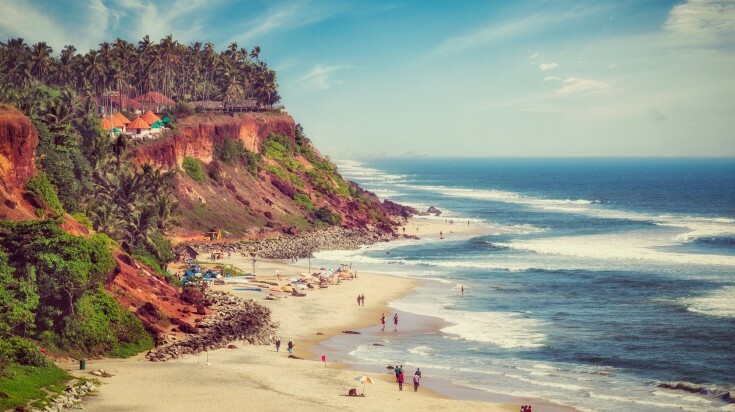 Good to know: Varkala is fast becoming known as a wellness destination and is popular with travellers seeking traditional ayurvedic treatments. The village is also home to Janardhanaswamy temple, a 2,000-year-old shrine. For many, arriving in Kerala after passing through some of India’s more brash and intense cities can come as a relief. The pace of life slows perceptibly, and the days spent in the cruising the steamy jungles, exploring the hills or lazing on the palm-fringed beaches can take on an almost dreamlike quality. For some, the hardest part is when it’s time to leave.